High and ever increasing prices for electricity exported from Russia to Mongolia is the most commonly quoted reason for Mongolia’s plans to build its own large hydropower. In case of Lake Baikal Basin this looks especially true, since part of water that rotates turbines at Angara Hydropower Cascade (belongs to En+Group) comes from Selenge river in Mongolia. During last 6 months several different new transmission lines for additional electricity exports for lower prices were proposed by Russian Grid Co, Republic of Buryatia, other entities. However promise of new cheap energy does not look credible until problems with existing overpriced supply are solved. In August the WB MINIS Project in Ulaan Baatar released response matrices on consultations held in May in Irkutsk Province of Russia, which clearly state that Russia and Mongolia recently agreed to lower prices for electricity by 30%, which, likely, makes those prices comparable to price for electricity that Russia exports to China. Similar news came from Russian side. The Minister of Natural Resources of Russia Sergei Donskoy on August 21 held a working meeting with the Minister of Foreign Affairs of Mongolia Tsend Munh-Orgil, according to the press service of the Ministry. Speaking about cooperation in the field of energy, the head of the Ministry of Natural Resources of Russia noted that a long-term mutually beneficial cooperation in the supply of electricity from Russia to the central and western regions of Mongolia indicates a reliable partnership between the energy companies of our countries. "As a result of the decisions taken by the Russian side, the purchase price of power for supplies to Mongolia in 2017 decreased, which led to a decrease in export prices in contracts for the supply of electricity for Mongolian companies," Sergei Donskoy emphasized. The successful cooperation between Russia and Mongolia was noted within the framework of the Russia-Mongolia-China economic corridor program, signed in June 2016 in Tashkent, as well as the results of activity of the working group on interaction between the Eurasian Economic Commission and the Government of Mongolia. The parties noted the need to sign an intergovernmental agreement on promoting regional and cross-border cooperation. In addition, the participants agreed to hold the 21st meeting of the Commission in the second half of October this year in Irkutsk. 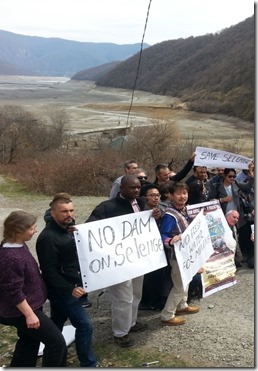 The Rivers without Boundaries Coalition members believe that more equitable agreement on electricity prices could be an important part of long-term solution to sustainable energy cooperation and joint protection of transboundary Lake Baikal –Selenge River basin. Our Coalition has always advocated for such solutions and is glad to see this movement in the right direction.